Striking dinosaur bone his and hers sterling silver black diamond wedding set. Matching handmade bands feature 2 channel set round black diamonds flanked by alternating black onyx and dinosaur bone inlay. The dinosaur bone is a nice red orange color with black cell walls. His wedding ring has 2 black diamonds totaling .16 carats set in the center. The ring is 6mm wide and is shown in a size 10 for scale. This ring will be made to order in 3 to 6 weeks. It is hand signed "MMH" by Mark Hileman on the inside of the ring. Her wedding band also has 2 channel set black diamonds totaling .12 carats. 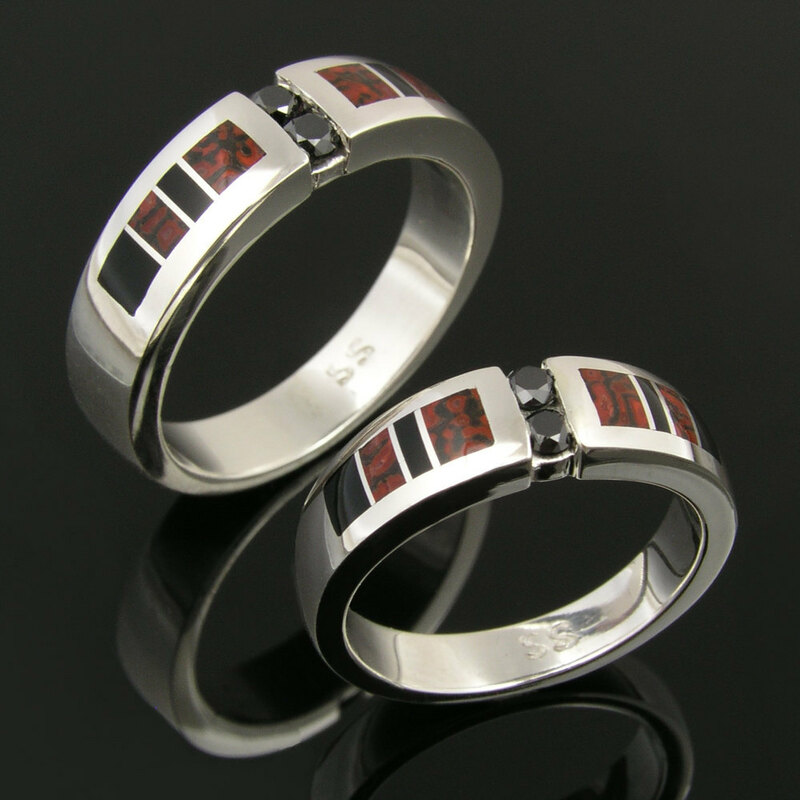 The dinosaur bone inlay in her ring is a perfect match to the red dinosaur bone in his band. Her ring measures 5.5mm wide and is shown in a size 6 1/2 for scale. This set is also available in other inlay materials and gemstones by special order. Please contact me for details. The dinosaur bone used in these rings is usually referred to as “gembone”. It is actually not bone but is a combination of minerals that have replaced the bone over time. Dinosaur bone is found in a rainbow of colors with the webbing color and cell size varying greatly from piece to piece. The varying cell size and colors creates some truly unique patterns and virtually one of a kind pieces of jewelry. Fossilized dinosaur bone can be composed of many different minerals including agate, jasper and calcite. The dinosaur bone color is determined by the combination of minerals present when the fossilized bone formed. A black diamond is a genuine diamond that has been enhanced through a radiation treatment to obtain a uniform black color. Just like white diamonds, black diamonds are a 10 on the Moh's hardness scale and make a good stone for everyday wear. The price shown is for women's ring sizes 4 to 8 and men's ring sizes from 7 to 11. All sizes larger than those will be an additional charge to cover wax work and extra silver. Please include your phone number and due date in the "Note to Seller" section at checkout and please read our policies before ordering. Price shown is for the 2 ring his and hers set but hers/hers and his/his ring sets are also available- contact me for prices. International shipping available to some countries. Contact me for details.